What do your photos means to you? Having being told countless times how important it is for a photographer to have one and after many attempts to get started, I have finally gotten around to starting a blog, before I go any further I would like to warn everyone that I am terrible at English, my spelling is dreadful and my grammar is even worse, so be prepared for many mistakes as life is just too short to be spell checking everything . The thing that caught my attention this weekend was how much our photographs mean to us, and I’m not just taking about professionally taken photographs with clean backgrounds and beautiful lighting, although, yes those are great too. I’m talking about the snaps that we all have tucked in the back of drawers, the ones where the flash was too bright, the top of Auntie Lucy's head has been chopped off, and the "photographer's" thumb is like a giant slug in the corner, and yet still we love that picture, we love it more than most, we love it because of the people that are in it, we love it because of the smiles on beautiful familiar faces, but most of all we love it because of the memories that are attached to it, and how this piece of shiny paper can evoke a memory more vivid that anything else on earth. I really do believe that the camera is the nearest thing we have to time machine; a photograph has a way like nothing else to transport us back in time. 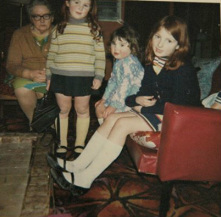 Family photographs become family treasures although we rarely realise it at the time they are taken. Recently a friend's mother passed away, So I spent most of my weekend searching through digital files for pictures of her to pass on to her family, I knew I had some, but was worried I might have deleted them as they weren't great, i.e. the lighting was bad or I just plain messed up on the exposure settings, So I was really happy when I found them. I found photographs of her laughing with her children, photographs of her looking proud and smitten as she cuddles the newest edition to her gang of grandchildren, Photos of her sitting at her kitchen table dunking a hob nob into a cup of tea. Pictures of most ordinary moments that happened countless times, but now are cherished ones. It made me think how important photographs are to us, they really are moments frozen in time and when memories are all that are left of a person, it’s comforting to have something of them, something that you can hold and touch and smile at,or cry over or just simply remember. So I’d urge everyone, take more photographs of the people that you love, and more importantly have them printed, even if you put them in the back of a drawer that you never look in. One day you'll come across them. If you're like me, this will most likely be the day before you go on holiday, you will be looking for your passport and then.... there they'll be and you’ll forget everything except the people in those pictures and all the times you had together and I hope you'll sit on the floor surrounded by junk pulled from presses while you look through piles of old photos and I hope that you find some real gems in there. OH and hopefully you'll find your passport too.